In 2013, the U.S. experienced a big shift in immigration: For the first time in decades, China and India beat out Mexico as the top senders of immigrants to the U.S. The shift in top migration source countries is remarkable because it happened so rapidly. Less than a decade ago, recent immigrants from Mexico outnumbered those from China and India, each by sixfold. 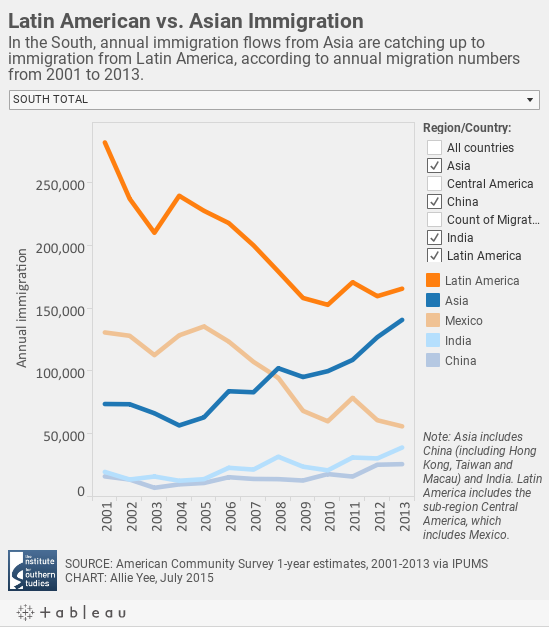 Even as Chinese and Indian migration has risen steadily, Mexican flows have declined much more swiftly. These trends are also shaping immigrant communities in the South*, a region that has experienced a dramatic rise in immigration since the 1990s. Immigrants from Mexico and more broadly Latin America, including Central and South America, continue to make up the largest share of recent immigrants to the region each year. But the South has also seen a boom in Asian immigrants, who are making up a significant portion of foreign-born newcomers to Southern states. These trends are strongest in political swing states in the South including Georgia, North Carolina and Virginia, which have emerged as major immigrant destinations as well as overall population magnets. Asian immigration has outpaced Latin American immigration for a few years in Georgia and Virginia, while the top spot has fluctuated in North Carolina. In 2013, more immigrants from China (including Hong Kong, Taiwan and Macau) or India came to these states than from Mexico. Other Southern states like Kentucky, Tennessee, Alabama and South Carolina have also become new immigrant destinations. Although these states have small immigrant populations, their immigration growth rates have skyrocketed over the past decade. Mexico has generally been the top country of origin in these states, but Asian immigration has fueled this growth as much and in some cases even more than immigration from Latin America. The South's traditional immigrant hubs – Texas and Florida – have unique dynamics. In Florida, the gap between annual Mexican immigration and immigration from China and India has closed in recent years. Regionally, however, Latin American immigration far outpaces overall Asian immigration due to significant immigration from other Central and South American countries. Texas has also long been a prime destination for Latin American immigrants, particularly from Mexico. But a recent state report found that annual Asian immigration has more than doubled in the past decade. It now rivals immigration from Latin America which declined over the same period. * The Institute for Southern Studies defines the South as Alabama, Arkansas, Florida, Georgia, Kentucky, Louisiana, Mississippi, North Carolina, South Carolina, Tennessee, Texas, Virginia and West Virginia. Annual immigration data calculated from the American Community Survey 1-year estimates, 2001-2013 via IPUMS-USA, University of Minnesota, www.ipums.org. This story has been edited to clarify that totals for China include Hong Kong, Taiwan and Macau.